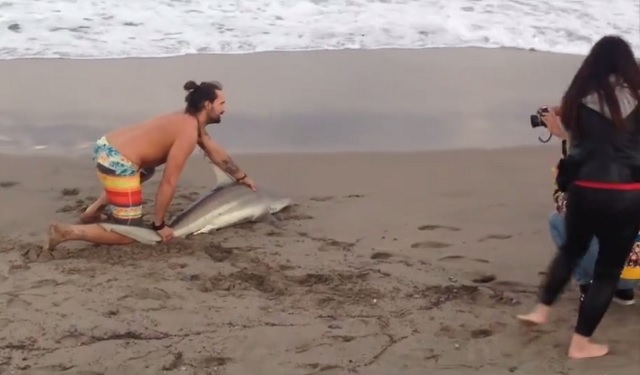 A South Florida man pulls a shark out of the ocean for photos. Credit: Still of Facebook video taken by Ashleigh Walters. PALM BEACH, Florida - A video of a Florida man pulling a shark out of the Atlantic Ocean to pose with it for a few photographs has gone viral on social media. NBC affiliate WPTV Channel 5 reporter Ashleigh Walters posted on her Facebook page a video of the man pulling what appears to be a juvenile bull shark from water onto shore in Palm Beach, Florida. The Facebook video shows that after a few unsuccessful attempts, the man was able to bring the shark onto the beach where he then pinned the apex predator long enough to get a few photographs of himself posing with the shark. According to Walters, the shark was later released back into deeper water after the video ended. Bull sharks are common along the east coast of Florida and juvenile bull sharks frequent the coast from Palm Beach, Florida to Daytona Beach, Florida. That's because the Indian River Lagoon, which extends along Florida's east coast from southern Volusia County to Palm Beach County, is an important nursery habitat for baby bull sharks. When fully grown, bull sharks reach 7 to 11 feet in length and weigh between 200 and 300 pounds. In addition to the great white shark and tiger shark, bull sharks are considered one of the "big three" shark species by the International Shark Attack File that inflict serious injuries or death to humans. Twenty-seven human deaths have been attributed to bull sharks. Bull sharks are one of the few species of sharks that can live in both fresh and saltwater.